TORONTO, ON – September 24, 2018 – Whether it’s a day on the trail or a night on the town, the Toyota 4Runner is ready to take you there – thanks to its winning blend of authentic, rugged 4x4 capability and a refined interior with comfort features and amenities designed to delight. New for 2019, Toyota introduces a Nightshade edition, offering the premium comfort and amenities of the top-level Limited grade 4Runner, enhanced with unique black detailing. Also for 2019, the very rugged Toyota 4Runner TRD Pro gains some features to make off-roading even more fun. As an authentic off-road Sport Utility Vehicle, the 4Runner combines heavy-duty body-on-frame construction with a powerful exterior design – featuring a bold grille, pronounced fender flares, power moon roof, alloy wheels, roof rails and running boards. Other exterior details of note include fog lamps, power adjustable and heated exterior mirrors with integrated signal lamps, and a rear spoiler. Inside, 4Runner’s power adjustable and heated front seats are accommodating and supportive. Second row 40/20/40 split seats recline up to 16 degrees for optimal comfort, and include one-touch fold-down function for convenient cargo carrying. Select models have space for seven adults, with the addition of split folding third row seats. In-cabin features common to all models include power door locks, power windows with auto up/down for all windows, a power vertical sliding rear window, rear privacy glass, plenty of in-cabin storage, illuminated vanity mirrors, map lamps and cargo area lamps, rear door courtesy lamp, keyless entry, five 12V auxiliary power outlets and anti-theft system. Drivers will appreciate the leather-wrapped steering wheel and shift knob, multi-information display with steering wheel-mounted controls, trip computer, auto-dimming rear view mirror, Eco Drive Monitor and fuel economy meter, cruise control and integrated garage door opener. Under the hood, the 4Runner packs a 4.0L V6 that generates 270 peak horsepower and up to 278 lb-ft of torque. This is mated to a five-speed automatic super electronically controlled transmission with overdrive, lockup torque converter and transmission cooler for responsive shifts, confident acceleration, and a fuel efficiency rating of 13.2L / 100KM (city/highway combined). Power is delivered to the road or trail via a one-touch, on-demand 4WD system with active traction control, hill start assist control and downhill assist control. The front independent double-wishbone suspension and four-link rear suspension are both enhanced with stabilizer bars – and a 9.6” ground clearance means it’s easy to roll 4Runner over most obstacles on the trail. When adventure requires a trailer, all 4Runner models are standard equipped with trailer sway control technology, a tow hitch and 4+7 pin wiring harnesses, and rated to haul up to 5,000 lb (2,268 kg). As a Toyota, the 4Runner also has impressive safety built in. This SUV’s impact-absorbing body efficiently and effectively channels impact energy around and away from the cabin, while a comprehensive collection of safety systems helps prevent or mitigate accidents. These include the Toyota Star Safety System, eight airbags, a tire pressure monitoring system, anchor points for child protection seats, a back-up camera, and more. The 2019 Toyota 4Runner (Starting MSRP: $46,155) is standard equipped with Toyota’s SR5 package. With room for seven, this model features an eight-speaker 6.1” touchscreen Display Audio system with advanced voice recognition, USB audio input, integrated Sirius XM satellite radio, navigation, and steering wheel-mounted controls. Other standard features include Bluetooth® connectivity, air conditioning, SofTex seating surfaces, 17” alloy wheels, and more. The 2019 Toyota 4Runner TRD Off Road (Starting MSRP: $48,540) adds a rear differential lock and lever-type 4WD selector plus several Toyota off-roading technologies, including 4-Wheel Crawl Control, the Kinetic Dynamic Suspension System, Multi-Terrain ABS and the Multi-Terrain Select System. This five-person model also sports off-road style alloy wheels with P265/70R17 tires, Optitron instrumentation, a rear door courtesy lamp and several style upgrades – including a hood scoop, TRD shift knob and floor mats, black end caps on the roof rails, the TRD logo on the front headlights and TRD C-pillar badges, black seats with red stitching and dark silver brushed metallic trim. 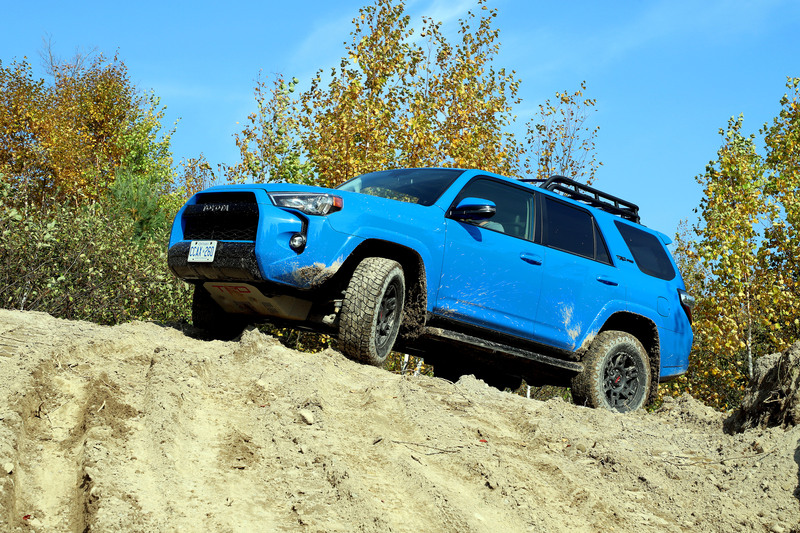 Inspired by Toyota Racing Development’s 35-year history of success in extreme off-road racing, the 2019 Toyota 4Runner TRD Pro (Starting MSRP: $56,580) is engineered to take on the most challenging terrain that Canada can put in your way. The TRD Pro model builds on the TRD Off Road package. New for 2019, this model is now equipped with TRD Fox Shocks, a silver TRD-stamped aluminum front skid plate, a basket style roof rack, and LED fog lamps. Other performance upgrades include those found in the Off-Road Package, plus TRD-tuned front springs and 31.5” Nitto Terra Grappler all-terrain tires on 17” matte black alloy wheels with TRD centre caps. Style upgrades include a unique Toyota Heritage front grille, TRD Pro floor mats and badging on the C-pillar and tailgate and black bumper accents. For 2019, a new Voodoo blue colour is available on the TRD Pro models. The 2019 Toyota 4Runner Limited 5-Passenger (Starting MSRP: $51,530) features full-time 4WD, the X-REAS Sport Suspension system, 20” alloy wheels plus a full-size spare tire and front and rear clearance sonar system. Premium upgrades include dual-zone automatic climate control, a 15-speaker JBL Audio system with subwoofer, leather seating, heated and ventilated front seats, a driver’s seat memory system, automatic headlamp system, woodgrain interior trim, puddle lamps, and the Smart Key System with Push Button Start. Additional styling cues include unique running boards plus chrome grille, body side mouldings, fog lamp surround, rear trunk trim and door handles. The 2019 Toyota 4Runner Limited 7-Passenger (Starting MSRP: $52,725) features the same upgrades as the 5-Passenger model, plus third-row seats. The 2019 Toyota 4Runner Nightshade (Starting MSRP: $55,115) is all new for 2019. This special edition model is built off the Toyota 4Runner Limited 7-Passenger, enhanced with automatic running boards. Unique styling cues include black bumpers, mirror cover, door handles, rocker panels and roof rack, black chrome grille, 20” black alloy wheels, a leather-clad shift knob with black trim and metal interior trim. The 2019 Toyota 4Runner is now on sale at Toyota Dealers across Canada. For complete and up to date details and specifications, visit www.toyota.ca/4runner.